Yesterday at BarCamp Boston, geeks abounded and were super pleasant. For those who haven’t worked in high tech, that is remarkable. Many programmers and others sheltered under the very wide engineer umbrella show off and show each other up. I didn’t see that competitiveness or criticism yesterday. That is except for the brief you’re-doing-in-wrong-and-inefficiently moments. As such, they were left-brain amusing. Take the sked board. It’s a running BarCamp joke that this is a manual operation, much like the beloved whiteboards in daily use. 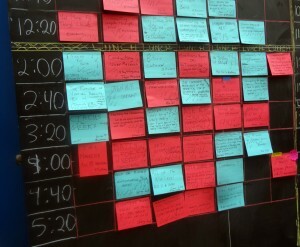 Each of the two days’ sessions gets a Post-it stuck to its time/location spot in the grid. In deference to modern life, the grid also goes online and nearly every attendant had and used one or more wireless devices. 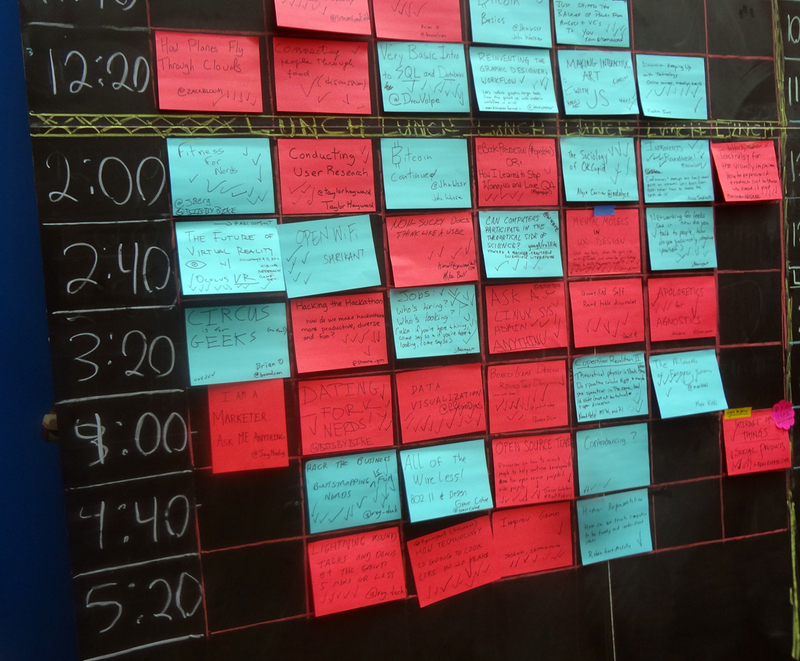 Several hundred folk waited for those who wanted to give sessions to put their topic on a Post-It, get enough checkmarks showing interest to justify moving it to the sked grid. Their minds clearly were spinning, because as a couple of volunteers climbed on tables to draw precise chalk lines for the grid, the suggestions started. First, the main woman using a cardboard template to guide the chalk was, as you’d expect, precise…a.k.a. slow. Her lines had to be this level and just so. People standing around waiting to see what they wanted to go to at 11am whispered suggestions for how to create the grid more efficiently. Then they called out their ideas. Meanwhile, more self-perceived wisdom occurred at the breakfast tables. Videoblog overlord, Steve Garfield got his version and I saw a truly efficient geek handle the coffee when it arrived. Steve wasn’t a volunteer, at least when he arrived. 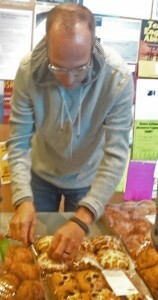 He did see the many shrink-wrapped trays of muffins, croissants and such. He went to take the plastic off only to hear the guy sort of watching them announce that he couldn’t. The claim was the no one could have muffins until the vats of coffee arrived. To the sentry, pastries require pastry and that’s that. Steve asked who was in charge and headed for them. They told him sure, get the muffins ready. Steve had figured all along that not everyone had to have coffee with their pastry. He used his low-tech tool, his car key, to cut the plastic. Meanwhile, his mother saw a pic of the muffins and wisely informed Steve the muffins were too big, that he should halve them. So he got a plastic knife and did that. There were a lot of muffins. The coffee arrived, three gigantic vats with spigots, and a bunch of boxes with pour spouts. Almost immediately, a long, single line formed and moved very slowly. The engineering mind of a few geeks next to me went to work. The first observation was that the gate was at the milk. The half or so of those getting coffee really wanted hot ice cream and fixed their coffee with both milk and sugar, a slow process. Then one 20-something acted. He could have rearranged the add-ins beyond the vats and sped up the process. Instead, he handled it much better by grabbing a box of coffee and a stack of paper cups. Calling out, “Who wants black coffee?” he went down the line. About half of those did, got a quick pour and the long line became a very short one in about two minutes. At least two smart guys worked for the common good.